Sample application by student for coming late to school on regular basis due to any reason. 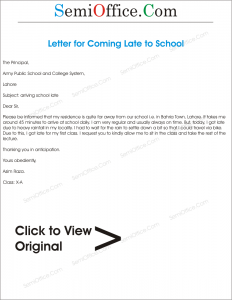 This application is to request a permission to come late at the school for this month. My father is going out of the city on his car for his office work. As due to no other conveyance of my own I had to come on local bus. The first bus which comes at 7:15am to nearby stop and reaches to the school at 8:30 am . so as due to such unforeseen circumstances I request to allow me to come half an hour late at the school only for this month. Please be informed that my residence is quite far away from our school i.e. in Bahria Town, Lahore. It takes me around 45 minutes to arrive at school daily. I am very regular and usually always on time. But, today, I got late due to heavy rainfall in my locality. I had to wait for the rain to settle down a bit so that I could travel via bike. Due to this, I got late for my first class. I request you to kindly allow me to sit in the class and take the rest of the lecture. Sit it is humbly stated that I am studying under your kind supervision in class 10th.A. Sir I want to bring your kind attention towards a work of urgent nature at my home today. Sir it might be in your knowledge that my father works abroad and he was on leave for last three months. Sir his leave has expired and he is returning to his job today. His seat is confirmed on the flight at 7.am today and I will have to go to the airport to see him off. Sir as you know that minimum travel time from airport to our area is one and half hour. Hence keeping above in view it requested that I may kindly be permitted to come to school late today at 10 am. Sir it is humbly stated that I am studying under your kind supervision in class 10th.A. as it is happening on frequent basis that I am coming late to school and getting warned by the school administration regularly. Sir today I want to draw your kind attention towards a consistent problem which I am facing daily. I am the eldest son of my parents and there are lot of responsibilities on me because my father works overseas. My one younger sister is studying in school 10 km away from our residence and there is no pick and drop service or public transport facility which can be availed by her. Moreover there is not any other school in our town for girls. Therefore I have to pick and drop her up to her school before coming to my own school. it is also in your knowledge sir that morning school timings of most of the schools are almost same. It is also worth mentioning that to leave her at her school much early will not be good even then I drop here there 15 minutes before the school timings. After that I only have 15 minutes to reach my school but unfortunately I have to face a railway crossing on the way which also destroys my 15 minute and ultimately I get late 10 to 20 minutes almost on regular basis. Keeping in view the above mentioned facts it requested that my this late coming to school due to unavoidable situation may please be over sighted. Sir it is hoped that my problem will be considered sympathetically.